I’m a water person (Pisces), born in Michigan and surrounded there by literally thousands of fishing lakes and encapsulated by seas of fresh water we call the Great Lakes. It would have taken a call of God on my life to make me leave these amazing waters and move to “seas” of corn, soybeans, and wheat. But that “call of God” showed up when I met Bill Gaither, a Hoosier English teacher who was teaching at the high school near Anderson College. I was a junior in college when I was sent to that high school to teach the French classes for a teacher who was out for a whole six-weeks period for cancer treatment. When Bill and I were married a year later, it took a while for me to deal with the withdrawal from water I felt and even longer to actually fall in love with beans and corn. As we have since traversed this great country singing, I have discovered that every region has its own particular charm—the desert states, the mountains, the seashores, the towering forests—and the great belly of the country we call “the bread basket of the world” is no exception. 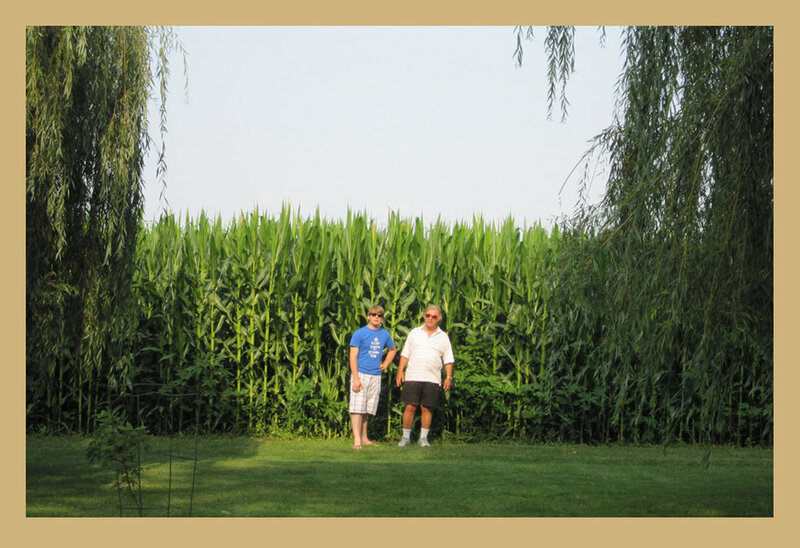 Folks here have the saying about the corn: “knee-high by the fourth of July,” but, trust me, the corn behind the barn at Grover’s Corners (Bill’s grandfather’s farm) is twice the height of our 6 ft. tall grandson Will. By the time the corn is that high, the beans are turning golden, so gold it dazzles the eyes to see it in the late afternoon sun. And in a week or so, the gold leaves disappear and the stems of ripened soybeans are a brown as rich as the acorns on the oaks. Our son Benjamin (who has created several fun projects for kids) used to joke with his sisters about the conversation neighboring farmers must have at the grain elevator when they get together to plan the next season. There had to be a song about that! But, trust me, it’s fun among friends who love this vast prairie and are thankful for it! In my life I have been given many wonderful gifts: lovely handmade embroidered items, expensive works of art, earthy rustic crafts, primitive water paintings on simple newsprint created by the chubby little hands of children. I have been honored and complimented. I have had the thrill of hearing the songs I’ve helped to create recorded by famous singers and sung by congregations in my own language and in foreign languages. These are all gifts I treasure. But none of these gifts have been so valuable to me as the gift of a rich childhood and youth in a solid, loving, celebrating home. The heritage of a family who loved God and each other, who greeted every new day with anticipation and openness, shaped my values and taught me that life was good. The healthy balance of discipline and freedom, the love of simple things, the respect for all kinds of persons, a deep reverence for God – all these wrapped up in special moments and given to me in the package I call my childhood. I truly believe that most of what I’ve been able to do with my life has been a direct result of the rich heritage I enjoyed. I am certain that my family gave me a head start on life with a realistic concept of God and His Son, a love affair with nature, and an excitement for living. My home brought me to the threshold of adulthood with a secure confidence that I was loved and a deep responsibility to myself and the world around me for developing whatever special abilities and gifts God had given me. At our house everything was an event, and it was to our house that Evelyn’s and my friends always came to “hang out”; we knew that if we needed a place for a gathering of any kind, it was okay to volunteer our place. Mother was the confidante for many a teenager, and it was not uncommon for someone in distress to knock on our door at midnight seeking comfort and advice. It never occurred to me to keep anything from her. She was my best friend. Soon our own children were running to her house whenever they needed someone to talk to or simply a place to be. She taught our son to paint with oils and to see things in a world around him that others miss. She critiqued our daughters’ poetry and boyfriends. She was their best friend too. When I married Bill, I found another big, loving family – an Indiana farm family, who loved the earth and celebrated harvests and holidays, Sundays and birthdays with big dinners and warm family gatherings: tables groaning with home-grown vegetables, fresh corn-fed meat, and steaming fruit desserts; children of all ages and sizes scampering around the patriarchs and assorted distant relations; the joyous noise of adult conversation, shrieking children, and spontaneous music. Because we so appreciate our own heritages, Bill and I chose to live near both our families. We believed there was great value for our children in knowing their roots, which gave them a sense of perspective and continuity. In a society as mobile as the one we all live in, Bill and I feel very blessed that we were able to offer our children a close relationship with their extended family and close friendships with their young cousins and aging relatives. Living close to our extended family has not always been problem free, but we feel the benefits far outweigh any problems. Good or bad, family is family and life is life. Children need a realistic view of the influences that have come together to make up the sum total of what they are. As Bill and I welcomed Suzanne, Amy, and Benjy into the world, we drew from the rich heritage we had been given to work toward becoming the kind of caring, compassionate family we believed God wanted us to be. Now our children have homes of their own, and Bill and I find great delight in watching them and their spouses pass on to our grandchildren the principles our parents gave us. We are all still “kids under construction,” fed and nourished in the soil of our shared pasts from the seeds God has planted in us. Just as our parents contributed so much to our children’s memory banks, we are now helping to make memories for our children’s children! The home is the natural habitat for growing human beings and shaping eternal souls. Whether we like it or not, we are molding lives … now. Let’s make these precious moments count.